Diane Bahr is a visionary with a mission. For more than 30 years, she has treated children and adults with feeding, motor speech, and mouth function problems. While she is a speech-language pathologist by training, she has also honed her skills as a feeding therapist, published author, international speaker, university instructor, and business owner. Diane co-owns Ages and Stages®, LLC with her husband and business manager Joe Bahr. She is also a mother and a grandmother. 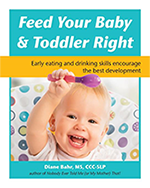 Diane's newest parent book FEED YOUR BABY AND TODDLER RIGHT: EARLY EATING AND DRINKING SKILLS ENCOURAGE THE BEST DEVELOPMENT (Future Horizons, 2018) is an updated, expanded, parent-friendly feeding manual for parents of children birth to age two years. It has crucial developmental checklists as well as good breastfeeding, bottle-feeding, spoon-feeding, cup-drinking, straw-drinking and chewing practices and what to do if problems arise. It can be purchased at Future Horizons, Amazon, and Barnes and Noble. Diane has been studying feeding, motor speech, and mouth function for most of her career. Her textbook ORAL MOTOR ASSESSMENT AND TREATMENT: AGES AND STAGES (Allyn & Bacon Publishers, 2001) was the first of its kind, addressing the assessment and treatment of these areas across the lifespan. Diane also co-chaired the Oral Motor Institute study group for 5 years to help improve understanding of oral sensory-motor treatment within the professional community. Diane's current parent book NOBODY EVER TOLD ME (OR MY MOTHER) THAT! EVERYTHING FROM BOTTLES AND BREATHING TO HEALTHY SPEECH DEVELOPMENT (Sensory World, 2010) is the comprehensive instruction manual every parent needs. It outlines and explains specific details of feeding, speech, and mouth development in the first 3 years of a child's life in a parent-friendly manner. Free Parent Book Guides make this book easy-to-use. Diane is removing the guesswork from childhood feeding, speech, and mouth development. So, let's help her create a cultural shift toward the prevention of feeding, speech, and mouth development problems in children and a legacy of the best mouth development possible in current and future generations. Learn more about Diane Bahr by reviewing her publications, presentations, and accomplishments.